Hautz J, Mayer M & Stadler C. 2013. Ownership Identity and Concentration: A Study of their Joint Impact on Corporate Diversification. British Journal of Management, 24, 102-126. Stadler C. 2010. Process innovation and integration in process oriented settings. The case of the oil industry. Journal of Product Innovation Management, 28, 44-62. Stadler, C. 2007. Four Principles of Enduring Success. Harvard Business Review, July-August 62-72. Stadler, C. 2007. Kultursensible Veränderung - Ein Transformationsansatz bei Unternehmen mit starken Werten. Die Unternehmung, 61, 189-212. Stadler, C., Verona, G. Hinterhuber, HH. 2007. Sustained Performance in the Oil Industry: A Dynamic Resource-based Model. Sinergie. 26. Stadler, C., Matzler, K., Hinterhuber, HH., Renzl, B. 2006. The CEO’s attitude towards the Shareholder Value and the Stakeholder Model. A comparison between the Continental European and the Anglo-Saxon Perspective. Problems & Perspectives in Management, 3. Matzler, K., Rier, M. Hinterhuber, H., Renzl, B., Stadler, C. 2005. Methods and concepts in management: significance, satisfaction and suggestions for further research: perspectives from Germany, Austria and Switzerland. Strategic Change, 14, 1-13. Stadler, C., Hinterhuber, HH. 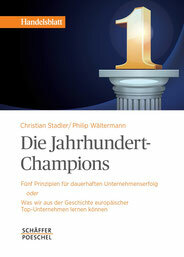 2005 Changing companies with strong values: Shell, Siemens and DaimlerChrysler. Long Range Planning, 38, 467-484.